IBM Content Collector is a family of products designed to collect, enhance and manage email, file systems and SAP® data and documents. Its capabilities identify and archive content based on business value and ensure that critical content is properly protected and retained. The comprehensive set of solutions offer a unified and integrated strategy to help extract value and gain intelligence from your content while driving down cost and risk. 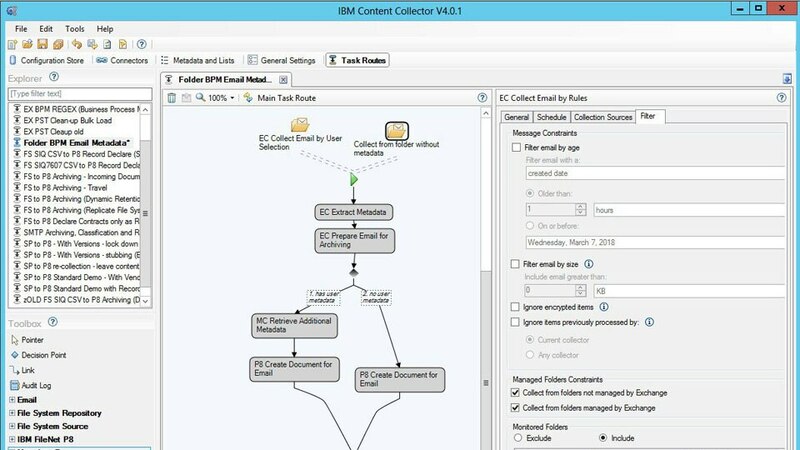 Content Collector can be deployed for many use cases and extended and integrated with other IBM products to meet advanced information classification, retention management and eDiscovery requirements. Provides flexible archiving so you can easily determine what data to archive and how, and broad based archiving to implement programs across both structured and unstructured data. Collects and archives email, files, collaboration and social business content based on your organizations business and regulatory needs. Helps you curtail over-retention by minimizing excess information. Enables you to retain, hold, and dispose of archived content efficiently and defensibly. Enables you to archive and migrate from a higher storage tier to a lower storage tier helping to reduce costs and improve performance.